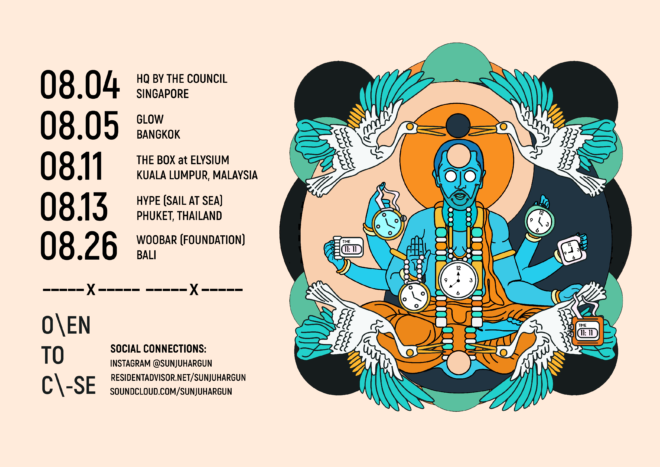 Bangkok-based, Asia-bred and world-class techno DJ Sunju Hargun is debuting a new concept tour in Asia next month based on the notion that a two-hour set just aren't enough anymore. With it being rare for DJs to play extended sessions anymore and 1-2 hour sets being the industry standard, Sunju's ‘Open to Close’ tour is inspired by time where he's played 10 – 13 hours sets and the performances will see him go back to that time to commandeer the decks on his own for the full night at several venues across Asia. This again is further testament to Sunju’s deft ear for music selection and curation. This will also give him an opportunity delve deeper into his collection and play music that he can’t usually fit into a 2-hour set with plenty of opportunities for those stranger B-sides cuts. Extended sets are what clubs in Europe have been getting right for a long time, where 4-hour sets are usually the minimum and artists like Kerri Chandler, Ben UFO and Theo Parrish play all night on the regular, so this is an opportunity to experience a whole other side to a DJs' storytelling. Coming straight off the plane from Europe, make sure you check out Sunju's extended sessions as the opportunity will be rare to experience crowd connection being pushed to the limit and it will be altogether a different vibe for those used to seeing 3+ DJs/night. See the full tour below.